We pride ourselves on giving individual students personal attention in their studies and specialize in small group teaching. Studying with us will open up a variety of opportunities in a wide range of careers, and throughout your degree we offer opportunities to enhance your employability to prepare you for the world of work. History is an engaging, challenging subject that offers the chance to understand and interpret human experience through the study of the past. We specialise in research-led teaching, where your lecturers will be experts in their field. You will have the opportunity to study courses spanning prehistory to the present day, encompassing British, Welsh, European and American History and the Archaeology of Britain and Ireland. Our excellence in teaching is consistently reflected in our National Student Survey Scores, where we consistently achieve high scores. The department has a proven record of research achievement, with the regular publication of books and articles by staff, several of whom have international reputations in their particular fields. These interests inform and shape our research-led teaching. Studying Philosophy and Religion at Bangor university offers you the opportunity to study some of the most important and challenging ideas that have shaped Eastern and Western cultures. Here you can choose to study a variety of religious and philosophical traditions, encompassing both analytical and continental philosophy, and religions of Eastern and Western tradition. 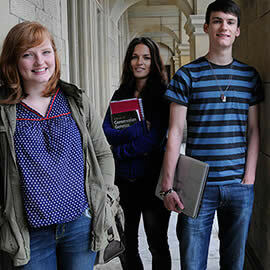 For those with an enquiring mind and seeking to cultivate new skills, Bangor may be the perfect place for you. We are known for the thoroughness of our teaching and our care for students. We also have a reputation for research of national and international excellence and the products of this research are continually fed into our courses. Many publications and articles by staff have international reputation in particular fields. All of our degree schemes offer a thorough training in the basic principles of social science, a wide choice of specialised subjects, training in the practice of social research and preparation for a wide variety of career opportunities.